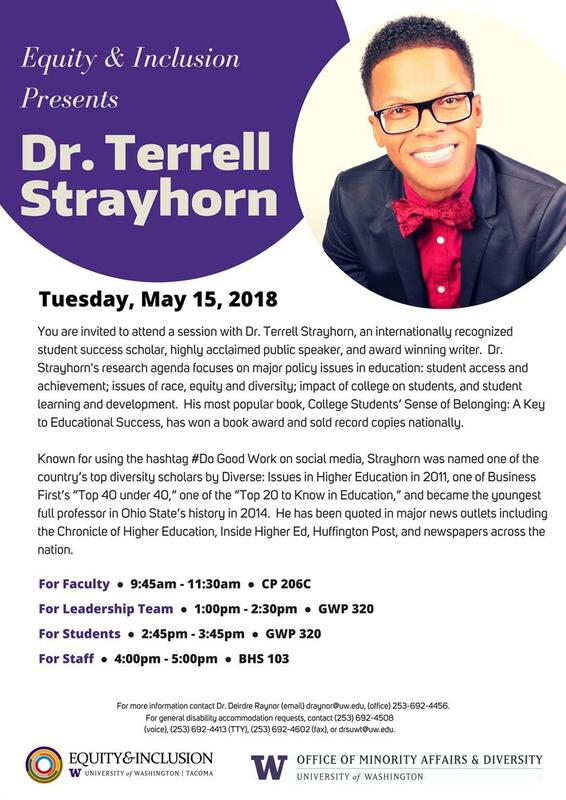 Tuesday, May 15, 2018, 9:45 a.m. – 5:45 p.m.
You are invited to attend a session with Dr. Terrell Strayhorn, an internationally recognized student success scholar, highly acclaimed public speaker, and award winning writer. Dr. Strayhorn's research agenda focuses on major policy issues in education: student access and achievement; issues of race, equity and diversity; impact of college on students, and student learning and development. His most popular book, College Students’ Sense of Belonging: A Key to Educational Success, has won a book award and sold record copies nationally. Known for using the hashtag #Do Good Work on social media, Strayhorn was named one of the country’s top diversity scholars by Diverse: Issues in Higher Education in 2011, one of Business First’s “Top 40 under 40,” one of the “Top 20 to Know in Education,” and became the youngest full professor in Ohio State’s history in 2014. He has been quoted in major news outlets including the Chronicle of Higher Education, Inside Higher Ed, Huffington Post, and newspapers across the nation.